This is Part 3 of a 3-Part series on the Types Of Wood For Rings. Part 1 Types Of Wood For Rings features Applewood, Birch, Bogwood, Cedar, Cherry, Chestnut, Ebony, Hackberry, and Juniper. In Part 2, we looked at Kauri, Koa, Mahogany, Maple, Oak, Osage Orange, Pine, Paduk, and Pearwood. This time, we’re looking at Purple Heart, Redwood, Rosewood, Teak, Walnut, and Zebrawood. Read on to find out more! Purple Heart wood makes for expensive wedding and engagement rings because it is an extremely hard wood to work – if an individual crafting a Purple Heart wood ring is inexperienced with the speed and precision of his cut, this wood will release a sap that will dull, if not damage, his tools. This downfall, though significant, is the only one associated with this stunning timber. The color of Purple Heart wood will vary with the age of the timber – a younger piece of this wood may display a light gray and violet undertones while a piece of matured wood will develop a bold majestic purple hue. Not only is it stunning in color, Purple Heart wood is also an extremely durable hardwood, with the additional perk of being intrinsically water resistant, making it significantly less prone to damage than many of its counterparts. Though it sounds expensive, Purple Heart wood is on the low spectrum of the scale when compared against other imported woods – however, as demand keeps going up for products made from this wood, it continues to dwindle in availability, a combination that will cause its prices to rise over time. 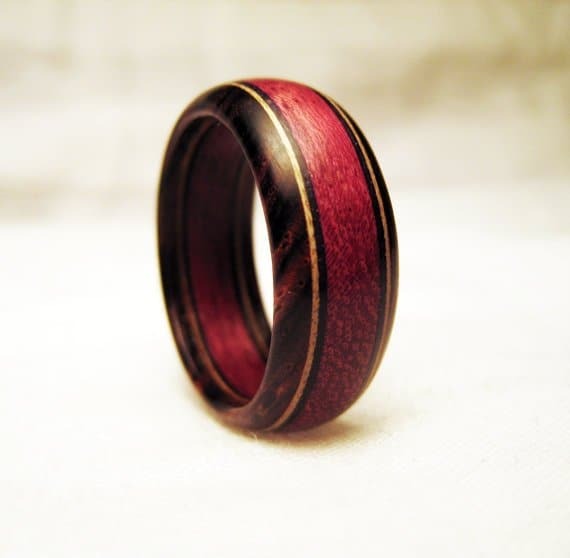 A wooden ring made from Purple Heart wood is a good choice for a bride or groom that want a unique wood wedding band that is also a great investment. In this next video, we see a woodworker showing us how you can bring out more purple in your purple heart wood working project. This of course goes for rings as well. As it’s name implies, the lumber from redwood comes in a deep and rich shade of reddish brown. The hue is associated with this wood is a result of the maturity of the timber which comes from treee that are not only the oldest, but also the tallest, in the world. 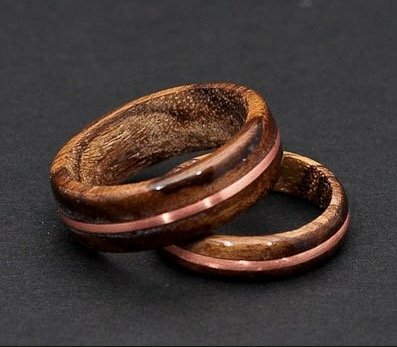 If you like what you’re reading but are in the market for a darker wooden ring, take note that redwood takes extremely well to polishes and finishes! 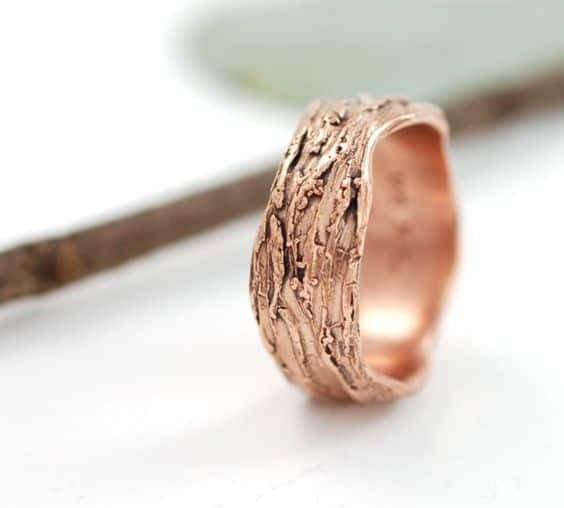 A ring made with redwood is a perfect choice for a bride and groom that want a ring that symbolizes the stability of their love, its ability to grow, and its resilience against the rest of time. While Rosewood is a general term that refers to a wide variety of warm toned reddish brown timbers found around the globe, rings constructed out of this wood share a similar aesthetic richness and appeal. While the trees from which rosewood originated are extensive, the two most popular ones are are the Brazilian Rosewood and East Indian Rosewood. Wood gathered from these trees is extremely durable and long lasting, and what more, it’s easily worked and used to build various beautiful and intricate household items. Rosewood is so durable that it is actually one of the leading woods in guitar production – insofar, displaying its ability to withstand extensive use over long periods of time. When you think of the modern take on barnwood flooring, or any other rustic furnishings, the color that might come to mind is a cool toned medium brown with ashy undertones – this is the color of teakwood. Teakwood is a tropical hardwood with a high demand! The natural oils that this type of wood produces protect it from splitting when worked which is a huge perk. These same oils, however, may make it difficult to stain or polish teak wood, but with its natural beauty, why would you want to?! Teak wood is rated at the absolute top standard of durability, making it long lasting and an effective material for a wedding or engagement ring. 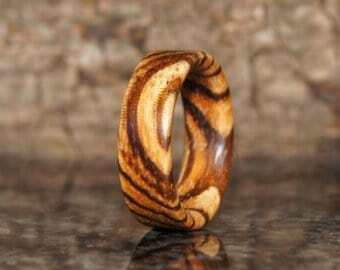 The biggest downfall of this ring is it’s price – teakwood is extremely expensive and becoming rarer as time passes. 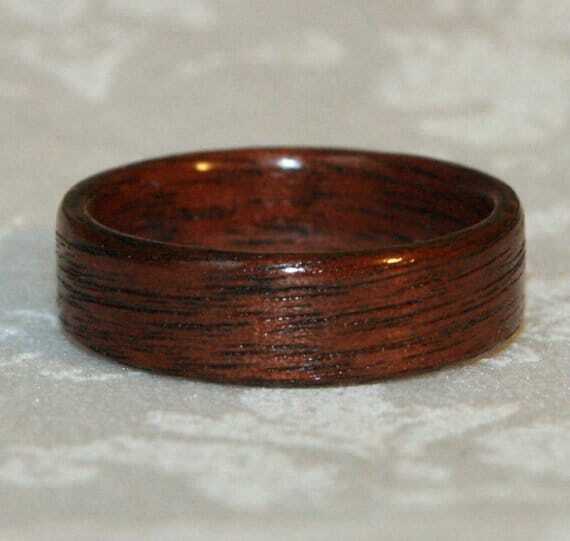 That said, if you want a wooden ring that will indefinitely withstand daily wear while building on its own worth, then one made out of Teak wood is a fine option for you! Here’s a video showing the making of a teak ring using a lathe. Being one of the most popular lumbers, we wouldn’t be surprised if you’ve already heard of Walnut. This stunning timber comes in a warm and creamy chocolate brown shade with extremely complimentary secondary tints of green, purple or red. Walnut has some of the most uniform and regular straight grains, making for a piece that exhumes class and tastefulness. 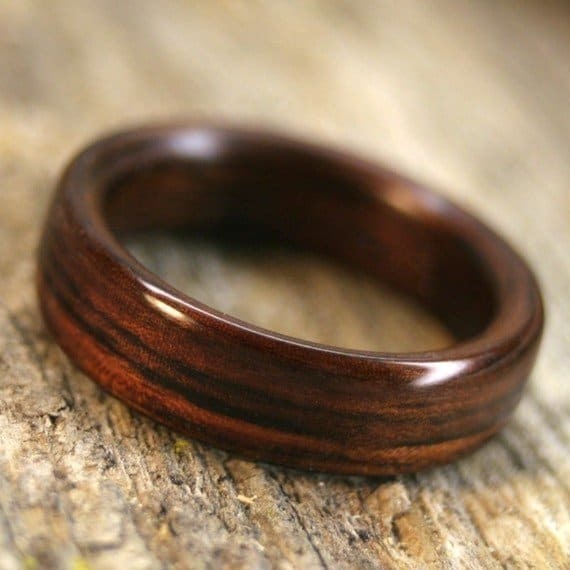 Walnut is an extremely durable wood that, as a ring, will be difficult to sing or scratch! This workable wood is also extremely friendly to stains and polishes, though few choose to utilize either due to the natural beauty of the wood. As you may have already guessed, Walnut is considered a premium hardwood and comes with a price that reflects that title – but we believe that the investment is worth the price! Take a look at this lovely mother’s day gift, made from apple and walnut wood. Are you an indecisive bride or groom that can’t decide between the elegance of dark wood or the elegance of light wood? We get it, we like it and we have a solution to your indecisiveness: Zebrawood. Zebrawood is a general term used to describe several types of woods that alternate in color. Much like an actual zebra. Zebrawood as a whole is a creamy light tan to milky white broken up by chocolate brown, or sometimes even black, streaks along the woods grain. This wood is more than just beautiful, it’s durable! It takes a seasoned woodsmith or craftsman to work Zebrawood, as it is a wood that splits with relative ease, but once it is tamed, it is a relatively easily worked wood. In terms of pricing, you might be surprised that this wood falls along the middle of the spectrum among the list – it’s not an inexpensive choice by any means, but it is an achievable one by every stretch of the word. Take a look at this zebrawood bowl to get a better idea what the wood looks like in living color. While there are certainly countless other lumbers that would make beautiful engagement or wedding bands, the list we compiled consists of those most popularly used among some of our personal favorites. Do you think we missed one that deserves to be on the list? Let us know in the comments!